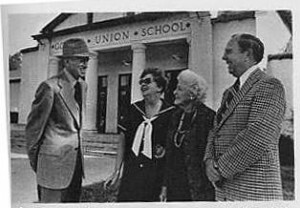 The Goleta Union School District has its origins in the consolidation in 1925 of the first three small elementary schools in the Goleta Valley, Cathedral Oaks, La Patera, and Goleta, known earlier as Rafaela School. Until 1957, the District operated one school, Goleta Union, on Hollister Avenue. The school is now the site of the Goleta Valley Community Center. From 1957 to 1969, the District built twelve new schools in response to the explosion in population as housing tracts rapidly replaced orchards in the valley. In 1975, in 1978, and in 1982, the District closed a total of five schools as it faced declining enrollment. Two of the schools later reopened, in 1996 and 1999, when enrollment began to grow moderately. This brief history is a work in progress. If you have corrections, additions, or photographs to contribute, please click here to e-mail the District Webmaster. Rafaela School is established. It is named after Rafaela Ortega Hill, wife a land-grant don of the Goleta Valley. Students are nicknamed “The Clodhoppers.” Frank E. Kellogg is the teacher from 1887 to 1897. Rafaela School is built near the southwest corner of the intersection of Patterson Avenue and Hollister Avenue. A new building for La Patera School is built west of Fairview near the site of the current Goleta Library. It is dubbed “The Hump-Floored School” because the weight of the upstairs teacher’s quarters causes the foundation to settle. “Two-Story School” replaces Rafaela School at 177 South Patterson Avenue. The four lower grades are downstairs; the four upper grades are upstairs. A $1,000 bond issue enables the building project. 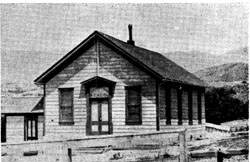 La Patera School is moved to Stow Ranch on La Patera Lane, north of the present railroad.The school bell is brought from San Francisco in 1897. It is moved to Goleta Union School in 1927 and to the present La Patera School in 1965. Rafaela School name is changed to Goleta School by popular petition. Goleta School is built to replace “Two-Story School,” which is deemed a firetrap.The new school is a one-story building with arched entrance and bell tower. The building is eventually moved in 1928 to the rear of the current Goleta Union site on Hollister Avenue. It serves as a kindergarten and First Grade building until it is demolished in 1957. Goleta Union School. Voters overwhelmingly approve the consolidation of Goleta School, La Patera School, and Cathedral Oaks School. Enrollment is 190. Trustees approve the construction of a new school and to ask voters to approve an $80,000 bond issue for new construction. Goleta Union School opens at 5679 Hollister Avenue. The school has eight classrooms, and an auditorium with theater stage. The cost is $65,000 for the building and $22,500 for the land. George Locey is the principal. Hal D. Caywood is named principal of Goleta Union School. Ellwood Union School is formed and incorporates Den School and Tecolote School. A new school is built at 7686 Hollister Avenue, site of the current Ellwood School. The Goleta Union School District eventually annexes Ellwood Union School in 1966. Dr. Ian Crow is named principal of Goleta Union School. Dr. Crow serves as principal and later as superintendent until his retirement in 1972. He oversees the construction of twelve new schools from 1957 to 1969 as the population of Goleta Valley explodes and the orchards are replaced by housing tracts. Cathedral Oaks School opens on Turnpike Road. Edward Zuzalek is named principal. The school remains open until 1978 when trustees respond to declining enrollment. The building is eventually sold to Santa Barbara City College, is now known as the Wake Center, and used as an adult education center. Isla Vista School opens on El Colegio Road. Joseph Albon is named principal. The school is demolished in 1998 and a new school is built on the same site in 1999. Fairview School opens on North Fairview Avenue. James Roberts is named principal. The school remains open until 1978. It currently houses the district offices. Hollister School opens on Anita Lane, south of Hollister Avenue. Charles Metcalf is named principal. This is the first of a series of five schools built with seven rectangular concrete block buildings and eighteen classrooms. Kellogg School opens on Cambridge Drive, south of Cathedral Oaks Road between Patterson and Fairview Avenues. Wayne Pelton is named principal. La Patera School opens on La Patera Lane, south of Cathedral Oaks Road. David Weaver is named principal. El Camino School opens on San Simeon Drive, north of Hollister Avenue, west of Turnpike Road. Earle Carter is named principal. The school is closed in 1982 and reopens in 1999. Ellwood School is annexed. Marie Alumbaugh is the principal. Mountain View School opens on Queen Ann Lane, north of Cathedral Oaks Road and west of Patterson Avenue. Edward Zuzalek is the principal. This is the first of two hexagonal “pod” schools. El Rancho School opens on Mirano Drive, south of Cathedral Oaks and west of Glen Annie Road. William Oliver is named principal. Brandon School opens as the District’s thirteenth school, on Brandon Drive, south of Cathedral Oaks Road and west of Glen Annie Road. The school is eventually closed in 1982 because of declining enrollment. It is reopened as a full school in 1996. District enrollment reaches 6,575 students. District enrollment peaks at 6,827 students. Dr. Robert Welling is named superintendent. Dr. William Paulo is named superintendent. Goleta Union School is closed. District enrollment has fallen to 6,153 students. The school does not meet earthquake safety requirements. The building is sold to the County of Santa Barbara and becomes the Goleta Valley Community Center. Below: Hal Caywood (l) and Ian Crow (r) with Isabella Waugh and Mrs. Chester Rich in front of Goleta Union School. Fairview and Cathedral Oaks Schools are closed. District enrollment has declined to 5,063 and falls to 4,583 in the fall. Frank M. Shultz is named superintendent. District office site is named after Jack H. Kramer. Jack was born in 1930. 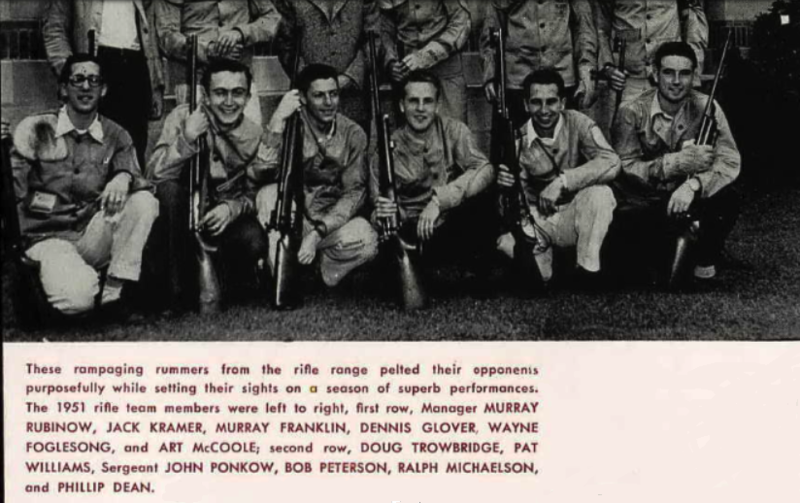 He went to UCSB and he is shown here in the 1951 yearbook with his rifle buddies. He is second from left. In 1959 he owned Jack Kramer’s “Flying A Service.” In 1962, he was the GUSD Building Inspector. In 1977, he became the GUSD Director of Facilities. Jack passed away in 1980 and was buried in the Goleta Cemetery. Brandon and El Camino Schools are closed. District enrollment declines to 3,718. District enrollment bottoms out at 3,413. Dr. Richard B. Shelton is named superintendent. Brandon School reopens. District enrollment has climbed back to 4,392.Voters approve a $26 million bond issue. El Camino School reopens. Enrollment peaks at 4,515. Isla Vista School inaugurates new building. Ida Rickborn is named superintendent. District enrollment declines again to 4,331 students. Dr. Kathleen Boomer is named superintendent. William Banning is named superintendent. Dr. Donna Lewis is named superintendent.